The squid fleet begins to arrive at Zuma Beach. By the time the sun goes down the bay will be full of boats. Curious Squid, so called because, as well as being squid, they were curious. That is to say, their curiosity was the curious thing about them. I always watch for them, this time of year. 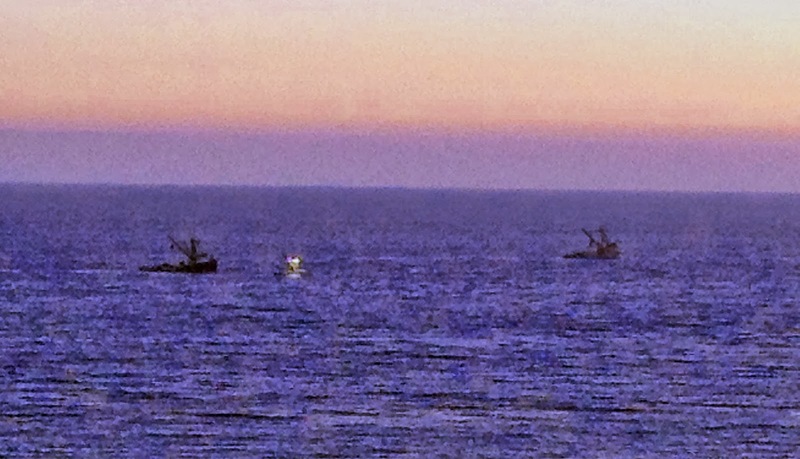 The eerie glow of the squid fleet's light boats is a sure sign of autumn in Malibu. 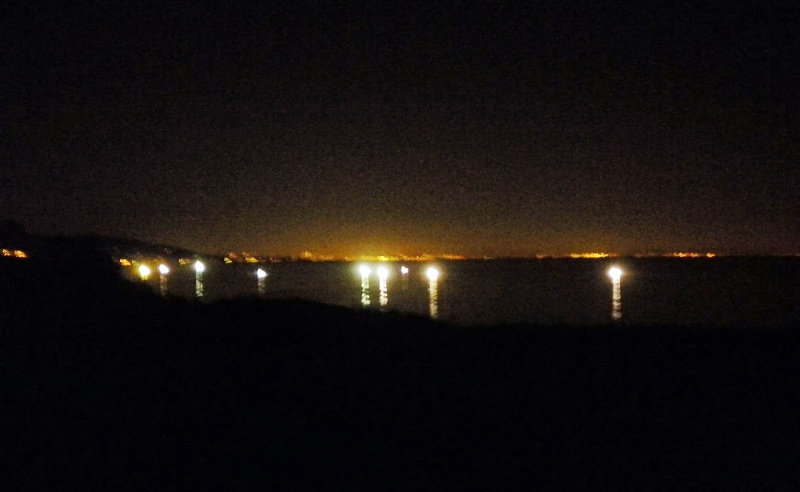 Along the coast, from Westward Beach to Point Mugu, the boats give the illusion of the lights of a phantom city out to sea. Like the Curious Squid that inhabit the Discworld’s Circle Sea, Loligo Opalescence, otherwise known as market squid, are curious. They are attracted to the powerful floodlights, and are scooped up by purse seiners. According to NOAA Fisheries Service, market squid is “the state’s largest and most lucrative commercial fishery, valued at over $69 million last season.” Most of the local catch is frozen and shipped to Asia, some squid is sold for bait, but fresh and frozen Malibu squid will appear on menus all over the world. As of October 8, “total landings of market squid are estimated to be 107,057.1 short tons. The DFW sets a limit of 118,000 “short tons” per season. Market squid live for less than a year—usually just six to eight months. Commercial fishing is not permitted on weekends to “give the squid a break.” Although the state of California has regulated the market squid fishery since 2005, many aspects of the life history of market squid reportedly remain unknown. The commercial squid boat crews aren’t the only ones depending on squid for a living, these small cephalopods are an essential food source for marine mammals and birds like the California brown pelicans. For Malibu residents, the appearance of the squid fleet at dusk, without even a glimpse of their curious quarry, often seems like an alien invasion. The boats follow to squid, using sonar to track them. Like the squid themselves, their presence off the coast is short-lived. By nightfall, squid light boats illuminate the bay. Their arrival is a sure sign of autumn in Malibu.